Just arrived in Los Angeles? Check out The Fake Angeleno. (I've also added the link to your starboard.) TFA is documenting the situation on the ground in Lo-Cal. As for the fake part: well, sometimes you have to solve the problem of artifice with more artifice. Turns out Gonzo was playing in San Rafael, so my daughters and I watched it last night. 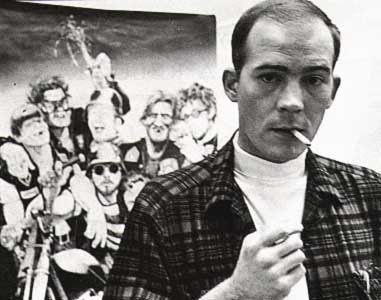 It's the best film I've seen, feature or doc, on Hunter Thompson. Two scenes gave me chills. One showed the Chicago police flaying demonstrators at the Democratic convention in 1968 to Janis Joplin's "Piece of My Heart." According to Thompson's wife, Chicago was one of two experiences that caused him to weep in her presence. Another moving scene shows an aged George McGovern, a Thompson favorite, lashing out against old men in air-conditioned offices in DC planning the next war. Doesn't sound like Spielberg stuff, I realize, but it got to me. As you might imagine, there are a few laughs, too. Many cluster around Thompson's run for sheriff in Aspen. Although Thompson was from Kentucky and spent most of his adult life in Colorado, the film identifies San Francisco in the 1960s as his true place and time. Check it out, I say. I just finished reading Obscene in the Extreme by Rick Wartzman. It's about the furor that followed the publication of John Steinbeck's The Grapes of Wrath in 1939. Rick focuses on the way that dust-up played out in Kern County, where the board of supervisors considered the merits of banning the book. Along the way, he weaves in the stories of major players in California agribusiness, labor, media, and government. That cast includes Carey McWilliams, whom Rick treats perceptively and at some length. But Rick is also very attuned to the stories of particular Kern County residents and families touched by the controversy. Highly recommended. Obscene in the Extreme isn't out yet--I threw around my ever increasing weight to get an advance copy--but I noticed that the publisher, PublicAffairs, used the jacket as the basis for its Fall catalog cover. That's a good sign, don't you think? We're hoping Rick will talk about the book this fall in Berkeley. More on that soon. I just learned about the death of Jules Tygiel, the San Francisco State historian. I interviewed Jules about Carey McWilliams, whose work he taught and understood very well. I also had the good fortune to meet him at a series of SF State lectures devoted to California politics. Jules's work, which focuses on California and baseball, is first-rate. Here's an article from the Los Angeles Times on him and his work. Jules was only 59. 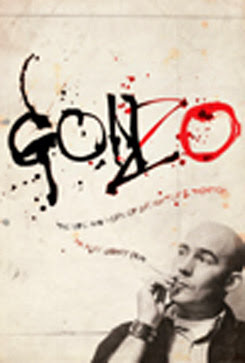 I haven't seen Gonzo, the Hunter Thompson doc from Alex Gibney, but here's A.O. Scott's review in the International Herald Tribune. Very happy to see mention of Carey McWilliams, of course, who first suggested that Thompson write about the Hell's Angels. That was a game changer, as Thompson always acknowledged. Throughout his career, he consistently admired and respected only one editor--Carey McWilliams. This according to Douglas Brinkley in Proud Highways, Thompson's edited letters. And let's not forget the Ramparts connection. Thompson was living on Parnassus Street in San Francisco during the magazine's heyday. After Peter Collier reviewed Hell's Angels, he brought Thompson by the office at 301 Broadway for lunch with Warren Hinckle. Let's just say that the result wasn't healthy for Hinckle's pet monkey, Henry Luce. Later Thompson hung with the Ramparts cohort at the Democratic convention in Chicago. He also borrowed the magazine's wall poster idea for later use in Aspen. And he eventually wrote the first generally recognized piece of Gonzo journalism, "The Kentucky Derby Is Decadent and Depraved," for Hinckle's subsequent magazine, Scanlan's Monthly. The photograph above is one of my favorites. I wanted to use it in American Prophet, but I couldn't track down a quality image or the rights holder. Review of Timothy Denevi's "Freak Kingdom"
Miriam Pawel's "The Browns of California"
Review of Gary Krist's "The Mirage Factory"
Review of Barlow's "Mother American Night"